Hatfield House is a traditional Irish Bar, recently restored to its former glory, with original bar fixtures, ornate ceilings and lavish craftsmanship carried out by the same craftsmen who worked on HMS Titanic. 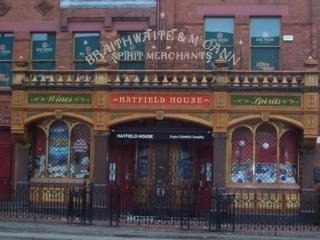 The Hatfield Bar is over 138 years old, it is one of the few bars in Belfast city to escape modernisation, and with live entertainment every night, is one of the city?s busiest bars. Hatfield House has something for all ages: for craic, atmosphere, live music, fresh food, cocktails, pool tables, big screen sports and all this with free admission every night! Have you got Google Earth on your computer? If so, then download the Google Earth view of The Hatfield House. Is this the wrong position for The Hatfield House? If you think so, then modify its position. Click / Tap the button above to get directions from where you are to The Hatfield House. Ended up coming here with friends when I was over from the States for a month. The staff were really friendly and interesting to talk to. A great selection of draught beer and the first real traditional authentic Irish bar I was in when over there. Loved the cosy fire and genuine antiques about the bar and the band playing that night were awesome. Definitely will be back, can't speak more highly of the place, a great spot! A great wee spot for a bit of banter. Its got an unbelievable selection of wines and beers and always something happening about the bar to keep punters entertained. To be honest i've moved back home from the U.S a year ago and haven't left this place. Has the best barstaff in Belfast, enough said. i like it because its class (loads of women and loads of drunk yobs like myself and lethal music) but i resent the fact that i must have spent over 10 000 there in the last 4 years! Hatfield.... Best place ever!!.. great craic, great drink, great music :)...!! and for those who say is a "hole" clearly must not get out much!! Prices where average but there wasn't much craic. The atmosphere was dead and on both nights I was there the place was underattended and over staffed. Maybe ok for a quick one but not somewhere worth seeking for a night out. Great Bar, best nights are Sunday, monday, tuesday and Wednesday! Great music, hot guys and booze, what more do you need! great place for an all day rippppp!!!!! What can I say, it's the Hat. Prob has the best lookin girls in the city (granted they're all prob from the country! ), great craic, great music, great atmosphere. Good pint of Guinness! Go for it, you'll love it. Blackstaff Folk are performing tonite Sunday @ Hatfield. Fun & games guaranteed. Excellent outfit! seriously worth a visit! live ents every night, loads of talent and special offers!! Staff very welcoming will be back soon!! Hatfield is some spot. Probably Best student bar in Belfast.